Chinua Achebe was born on November 15, 1930, in Ogidi in Eastern Nigeria. His family belonged to the Igbo tribe, and he was the fifth of six children. Representatives of the British government that controlled Nigeria convinced his parents, Isaiah Okafor Achebe and Janet Ileogbunam, to abandon their traditional religion and follow Christianity. Achebe was brought up as a Christian, but he remained curious about the more traditional Nigerian faiths. He was educated at a government college in Umuahia, Nigeria, and graduated from the University College at Ibadan, Nigeria, in 1954. Achebe was unhappy with books about Africa written by British authors such as Joseph Conrad (1857–1924) and John Buchan (1875–1940), because he felt the descriptions of African people were inaccurate and insulting. While working for the Nigerian Broadcasting Corporation he composed his first novel, Things Fall Apart (1959), the story of a traditional warrior hero who is unable to adapt to changing conditions in the early days of British rule. The book won immediate international recognition and also became the basis for a play by Biyi Bandele. Years later, in 1997, the Performance Studio Workshop of Nigeria put on a production of the play, which was then presented in the United States as part of the Kennedy Center's African Odyssey series in 1999. Achebe's next two novels, No Longer At Ease (1960) and Arrow of God (1964), were set in the past as well. By the mid-1960s the newness of independence had died out in Nigeria, as the country faced the political problems common to many of the other states in modern Africa. The Igbo, who had played a leading role in Nigerian politics, now began to feel that the Muslim Hausa people of Northern Nigeria considered the Igbos second-class citizens. Achebe wrote A Man of the People (1966), a story about a crooked Nigerian politician. The book was published at the very moment a military takeover removed the old political leadership. This made some Northern military officers suspect that Achebe had played a role in the takeover, but there was never any evidence supporting the theory. During the years when Biafra attempted to break itself off as a separate state from Nigeria (1967–70), however, Achebe served as an ambassador (representative) to Biafra. He traveled to different countries discussing the problems of his people, especially the starving and slaughtering of Igbo children. He wrote articles for newspapers and magazines about the Biafran struggle and founded the Citadel Press with Nigerian poet Christopher Okigbo. Writing a novel at this time was out of the question, he said during a 1969 interview: "I can't write a novel now; I wouldn't want to. And even if I wanted to, I couldn't. I can write poetry—something short, intense, more in keeping with my mood." Three volumes of poetry emerged during this time, as well as a collection of short stories and children's stories. After the fall of the Republic of Biafra, Achebe continued to work at the University of Nigeria at Nsukka, and devoted time to the Heinemann Educational Books' Writers Series (which was designed to promote the careers of young African writers). In 1972 Achebe came to the United States to become an English professor at the University of Massachusetts at Amherst (he taught there again in 1987). In 1975 he joined the faculty at the University of Connecticut. He returned to the University of Nigeria in 1976. His novel Anthills of the Savanna (1987) tells the story of three boyhood friends in a West African nation and the deadly effects of the desire for power and wanting to be elected "president for life." After its release Achebe returned to the United States and teaching positions at Stanford University, Dartmouth College, and other universities. teaching position at Bard College, Annandale-on-Hudson, New York. In 1999, after a nine-year absence, Achebe visited his homeland, where his native village of Ogidi honored him for his dedication to the myths and legends of his ancestors. 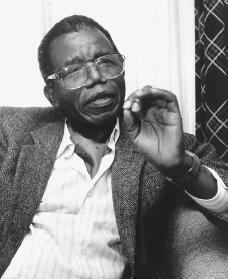 In 2000 Achebe's nonfiction book Home and Exile, consisting of three essays, was published by Oxford University Press. Carroll, David. Chinua Achebe. New York: St. Martin's Press, 1980. Ezenwa-Ohaeto. Chinua Achebe: A Biography. Bloomington: Indiana University Press, 1997. Innes, C. L. Chinua Achebe. New York: Cambridge University Press, 1990.
great novelist!what is the summary of heart of darkness?